Not every synagogue in Jerusalem is Orthodox. 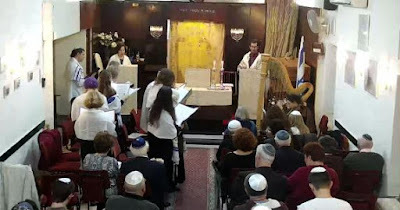 In fact, Kehilat Har-El, a reform shul, just celebrated its 61st anniversary at its home in central Jerusalem. Kehilat Har-El, established in 1958, is the founding congregation of the Israel Movement for Reform and Progressive Judaism. Located in a classic pre-state style building (next to the Artists’ House), it serves as a home for Jewish Renewal through prayer, study, social justice, culture, and art. Last week, the Har-El choir, conducted by Cantor Evan Cohen and accompanied by harpist Gittit Boasson. sang Adon Olam, arranged by Bonia Shur as part of the Shabbat evening service in honor of the anniversary.